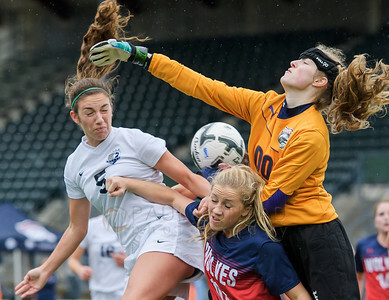 Squalicum's Braeden Hilleary (5) watches as the ball goes over Black Hills defender Janae Grimm (10) and goalkeeper Jordan Westby during the first half of the Class 2A Girls' Soccer State Quarterfinals on Saturday afternoon Nov. 14, 2015, at Civic Field in Bellingham, Wash. Squalicum defeated Black Hills 6-0 to advance to the semi-finals at Shoreline Stadium on Saturday November 20th. 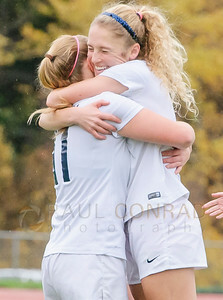 Squalicum's Catelyn Stevens (11), left, congratulates Kim Hazlett (3) after Hazlett scored the first goal against Black Hills during the first of the Class 2A Girls' Soccer State Quarterfinals on Saturday afternoon Nov. 14, 2015, at Civic Field in Bellingham, Wash. Squalicum defeated Black Hills 6-0 to advance to the semi-finals at Shoreline Stadium on Saturday November 20th. 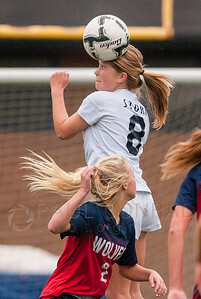 Squalicum's Sarah Hulbert (8) gains height over Black Hills' Sidney Lowe (2) to head the ball away from the goal during the first half in the Class 2A Girls' Soccer State Quarterfinals on Saturday afternoon Nov. 14, 2015, at Civic Field in Bellingham, Wash. Squalicum defeated Black Hills 6-0 to advance to the semi-finals at Shoreline Stadium on Saturday November 20th. 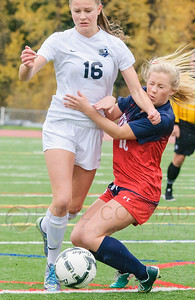 Squalicum's Kim Dorr (16) collides with Black Hills' Janae Grimm (10) in the first half of the Class 2A Girls' Soccer State Quarterfinals on Saturday afternoon Nov. 14, 2015, at Civic Field in Bellingham, Wash. Squalicum defeated Black Hills 6-0 to advance to the semi-finals at Shoreline Stadium on Saturday November 20th. 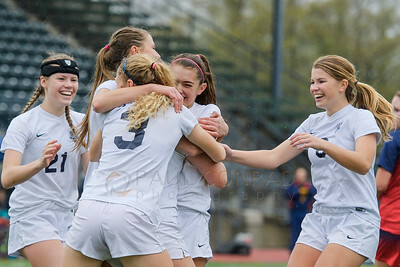 The Squalicum girls celebrate their third goal against Black Hills during the second half of the Class 2A Girls' Soccer State Quarterfinals on Saturday afternoon Nov. 14, 2015, at Civic Field in Bellingham, Wash. Squalicum defeated Black Hills 6-0 to advance to the semi-finals at Shoreline Stadium on Saturday November 20th. 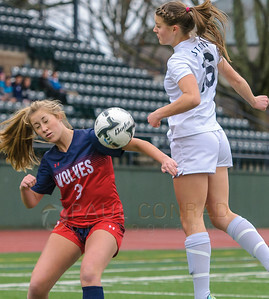 Black Hills' Sam Lindsey (3), left, and Squalicum's Kim door (16) battle for the ball early in the first half of the Class 2A Girls' Soccer State Quarterfinals on Saturday afternoon Nov. 14, 2015, at Civic Field in Bellingham, Wash. Squalicum defeated Black Hills 6-0 to advance to the semi-finals at Shoreline Stadium on Saturday November 20th. 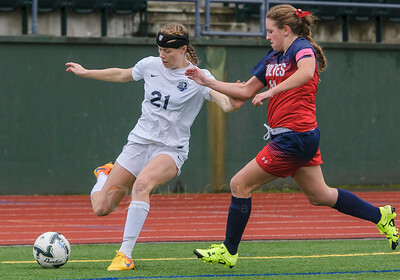 Squalicum's Kendra Steele (21) kicks the ball towards the goal as Black Hills' Bella Brown (14) moves in during the first half of the Class 2A Girls' Soccer State Quarterfinals on Saturday afternoon Nov. 14, 2015, at Civic Field in Bellingham, Wash. Squalicum defeated Black Hills 6-0 to advance to the semi-finals at Shoreline Stadium on Saturday November 20th. 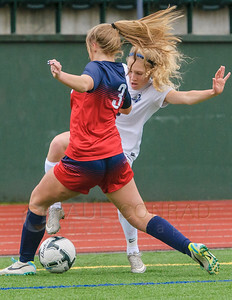 Images from the Squalicum vs. Black Hills in the Class 2A Girls' Soccer State Quarterfinals on Saturday afternoon Nov. 14, 2015, at Civic Field in Bellingham, Wash. Squalicum defeated Black Hills 6-0 to advance to the semi-finals at Shoreline Stadium on Saturday November 20th. 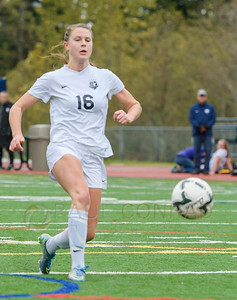 Squalicum's Rachel Dorr (14) boots one out of midfield during the first half of the Class 2A Girls' Soccer State Quarterfinals on Saturday afternoon Nov. 14, 2015, at Civic Field in Bellingham, Wash. Squalicum defeated Black Hills 6-0 to advance to the semi-finals at Shoreline Stadium on Saturday November 20th. 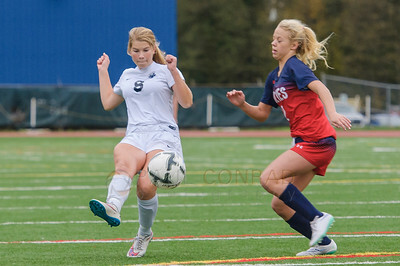 Squalicum's Kim Hazlett (3), right, tricks the ball past Black Hills' Sam Lindsey (3) during the first half in the Class 2A Girls' Soccer State Quarterfinals on Saturday afternoon Nov. 14, 2015, at Civic Field in Bellingham, Wash. Squalicum defeated Black Hills 6-0 to advance to the semi-finals at Shoreline Stadium on Saturday November 20th. 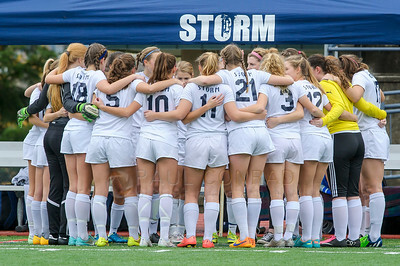 Squalicum Storm girls get ready to battle the Black Hills Wolves in the Class 2A Girls' Soccer State Quarterfinals on Saturday afternoon Nov. 14, 2015, at Civic Field in Bellingham, Wash. Squalicum defeated Black Hills 6-0 to advance to the semi-finals at Shoreline Stadium on Saturday November 20th. 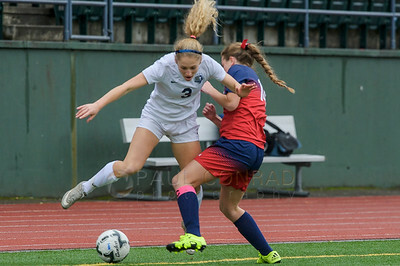 Squalicum's Kim Hazlett (3) moves past Black Hills' Bella Brown during the second half in the Class 2A Girls' Soccer State Quarterfinals on Saturday afternoon Nov. 14, 2015, at Civic Field in Bellingham, Wash. Squalicum defeated Black Hills 6-0 to advance to the semi-finals at Shoreline Stadium on Saturday November 20th. 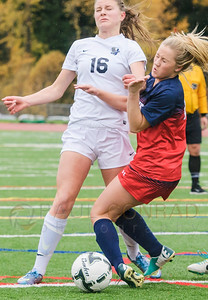 Squalicum's Kim Dorr (16) boots one past Black Hills' goalkeeper Jordan Westby (00) during the first half of the Class 2A Girls' Soccer State Quarterfinals on Saturday afternoon Nov. 14, 2015, at Civic Field in Bellingham, Wash. Squalicum defeated Black Hills 6-0 to advance to the semi-finals at Shoreline Stadium on Saturday November 20th. 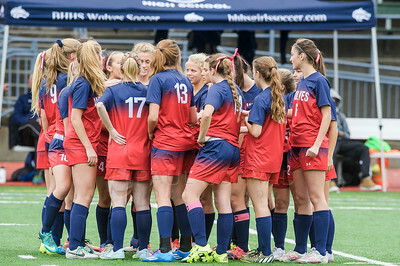 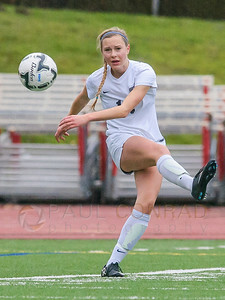 Black Hills Wolves prepare to battle the Squalicum Storm in the Class 2A Girls' Soccer State Quarterfinals on Saturday afternoon Nov. 14, 2015, at Civic Field in Bellingham, Wash. Squalicum defeated Black Hills 6-0 to advance to the semi-finals at Shoreline Stadium on Saturday November 20th. 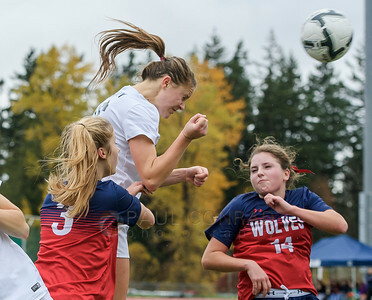 Squalicum's Kim Dorr (16) attempts to head a goal past Black Hills' Sam Lindsey (3), left, and Bella Brown (14) during the second half in the Class 2A Girls' Soccer State Quarterfinals on Saturday afternoon Nov. 14, 2015, at Civic Field in Bellingham, Wash. Squalicum defeated Black Hills 6-0 to advance to the semi-finals at Shoreline Stadium on Saturday November 20th. 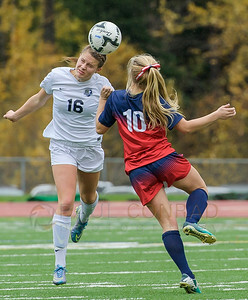 Squalicum's Kim Door (16) heads the ball past Black Hills' Janae Grimm (10) during the second half in the Class 2A Girls' Soccer State Quarterfinals on Saturday afternoon Nov. 14, 2015, at Civic Field in Bellingham, Wash. Squalicum defeated Black Hills 6-0 to advance to the semi-finals at Shoreline Stadium on Saturday November 20th. 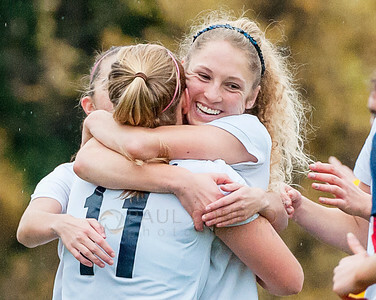 The Squalicum girls celebrate their goal against Black Hills during the secondhalf of the Class 2A Girls' Soccer State Quarterfinals on Saturday afternoon Nov. 14, 2015, at Civic Field in Bellingham, Wash. Squalicum defeated Black Hills 6-0 to advance to the semi-finals at Shoreline Stadium on Saturday November 20th. 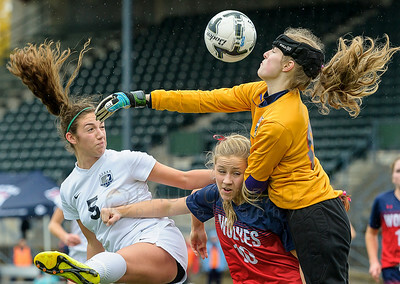 Squalicum's Braeden Hilleary (5), left, Black Hills defender Janae Grimm (10) and goalkeeper Jordan Westby during the first half of the Class 2A Girls' Soccer State Quarterfinals on Saturday afternoon Nov. 14, 2015, at Civic Field in Bellingham, Wash. Squalicum defeated Black Hills 6-0 to advance to the semi-finals at Shoreline Stadium on Saturday November 20th. 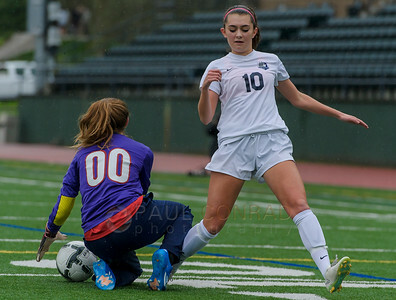 Squalicum's Payton Fowler (10) is stopped by the Black Hills goalkeeper during the second half in the Class 2A Girls' Soccer State Quarterfinals on Saturday afternoon Nov. 14, 2015, at Civic Field in Bellingham, Wash. Squalicum defeated Black Hills 6-0 to advance to the semi-finals at Shoreline Stadium on Saturday November 20th.